We have seen plenty of pics of NECA’s Nightmare On Elm Street Freddy Krueger and Nightmare On Elm Street 2: Freddy’s Revenge Freddy Krueger, now we have confirmation that the figure has been released at retail. Toyark forum member BlackMagnus reports that the figures are becoming available at Toys “R” Us stores. 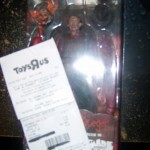 Click the thumbnail for a pic of the NOES1 Freddy with receipt. Discuss on the Toyark Forums› Views: 3873 › Credit: BlackMagnus of the Toyark Forums! 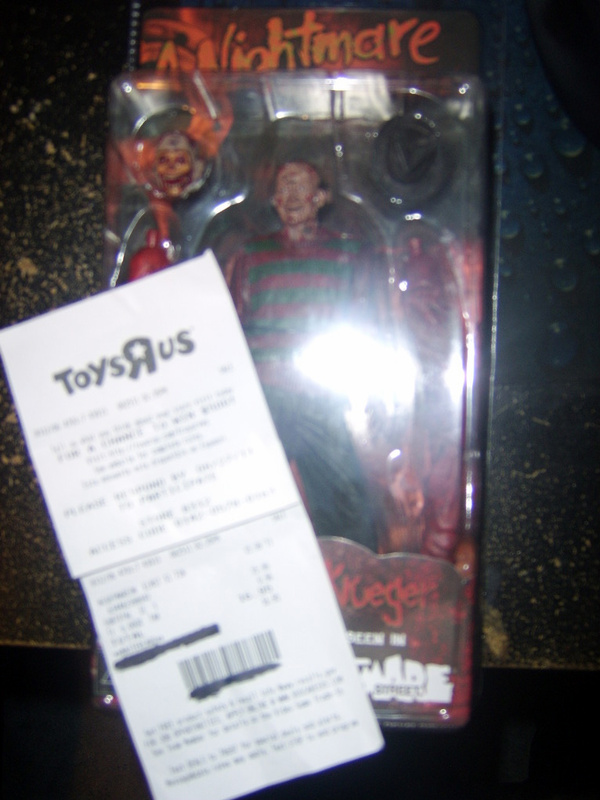 I was curious if he had been found at retail or bought from Amazon etc., so, today while my wife was out at the local TRU baby shopping, she found some "Freddy" figures. I immediately asked her if he had the long arms, because I know of an older version that may still be lingering on the shelves, to which her reply was yes! She said there were 2 of the stretched arms and 2 with just the extra head (NoES 2: Freddy's Revenge version). So get out there and get them! Pretty sure this hasn't been reported yet but, if it has, please lock. Thanks. Please excuse the poor quality pic, the huge glare adds to the graininess, on top of my lamps for my lightbox crapping out awhile ago equals meh. I forgot about this thread, I almost forgot to upload the pic, sorry. Sweet. I pre-ordered mine from BBTS and I received an email yesterday saying that they were now in stock. The pics I've seen look great. I plan on buying these ASAP but I'll probably go the online route(as I don't have a TRU around close) if I can get them for cheap enough. Edited first post with pic.